A key theme within the sporting world is the notion of bragging rights. These can, more often than not, be limited to local rivals debating as to who is the better team overall. Sometimes, it can regrettably happen on an interdisciplinary level, with players and fans of different sports arguing over which one carries more merit, such as the debate between football and rugby. Then there are those moments when bragging rights simply boil down to who was there to witness history first-hand. While only a limited number of spectators could possibly see the event take place live, countless others will claim that there were also present to share the moment. 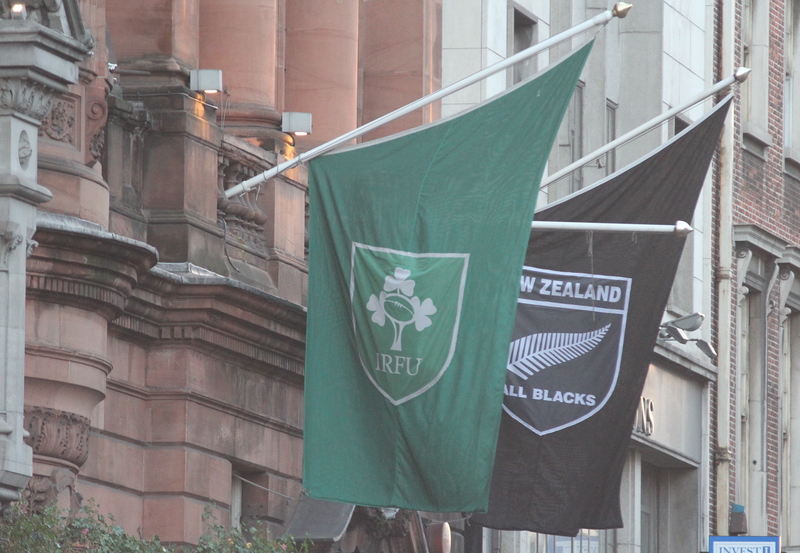 Ireland’s historic victory over New Zealand will in time become one of those moments – roguish old men will someday proudly claim: “I was there when we stuffed the All Blacks”, before downing their pints in some musty pub down the country. The truth is that he was probably nowhere near the Aviva Stadium on Saturday November 17, 2018. Yet, their stretching of the truth will be a testament to what the Irish rugby team achieved this November Series. To take on the All Blacks so fearlessly and come out on top is a massive achievement, especially for a team who historically used to fall short when faced with the ultimate test. Their victory was the quintessential team performance; the players, coaches, and backroom staff all combined to produce a fluid, robust, and comprehensive gameplan which unravelled the two time world champions. Add to that the scrappy showing against Argentina and the phoney game against USA, and this series has been the perfect preparation for the World Cup next year. The only concern is that this brilliant team may be peaking at precisely the wrong time. If the aim of this November Series was to offer a scenario as close to the World Cup as possible, then it was a rousing success. Heading into the Autumn Internationals, Ireland were coming off the back of a spectacular season, achieving a Grand Slam in the 2018 Six Nations and picking up their first ever series win in Australia. Of course, the showdown with New Zealand was the pick of the fixtures. This resulted in the match against Argentina a week before being somewhat overlooked by both fans and the media. Fears grew that the Irish team would therefore be complacent in their clash with Los Pumas. Indeed, Argentina proved why it is necessary to take each game seriously. Marshalled by stalwart out-half Nicolas Sanchez, Argentina’s back three exposed the weakness in defence on Ireland’s left wing, while also testing their exemplary disciplinary record. Although the Irish regained their composure as the match went on, their seemingly inferior opposition were still in the game with 20 minutes to go. Thankfully, Ireland’s substitutes were able to put the game to bed and avoid an embarrassing upset before the ultimate test a week later. This was an important lesson for Joe Schmidt’s side, as World Cup success is based on a team’s ability to treat every opponent with respect, regardless of how unbalanced the tie is. After all, Ireland have hosts Japan among their group stage opposition at next year’s World Cup. It would be a complete disaster if they overcame an improving Scotland side, only to fall short against a relatively weaker team like the Brave Blossoms. After such an outstanding performance, it may seem slightly pessimistic to find any fault with the events of the last three weeks. However, Steve Hansen’s post-match claim that Ireland are now favourites to win the World Cup is as much a curse as it is a blessing. Irish sports teams have a complicated relationship with being favourites. When dismissed as underdogs, Irish sides love to cause an upset, particularly when all that’s at stake is a little national pride. However, they also have a tendency to self-destruct when a flawless display is necessary. There are countless examples of this across all codes, but it is the rugby teams that frequently fall prey to this phenomenon. Ireland were tipped to win the 2017 Six Nations, with England seen as the only credible threat to their chances, but seemingless harmless teams like Wales and Scotland managed to scupper Schmidt’s plans and crush the Irish hope of a win. Basically, what has constantly let Ireland down in the past is a lack of professionalism and composure. When there is a point to prove, teams will always deliver, yet when riding high, all it takes is a slight wobble before the wheels fall off the wagon. Despite all this, in recent years Leinster have defied the status quo and proven that Irish sides are capable of producing more than just one-off victories. Perhaps it is the prevalence of Leinster players in the national squad that has transformed Ireland into a rugby superpower. All this demonstrates why Joe Schmidt is fundamental to the team’s success. He has imbued his players with a powerful sense of self-worth, who now see themselves as on the same level as the All Blacks. Good coaches create a team that can win, but great coaches give players the belief that they should win. November’s tests have confirmed what the rugby world already knew. Ireland have become a complete side since 2015 and a genuine challenger to New Zealand’s throne. A convincing win against the reigning World Champions suggests huge promise for this team, who also managed to put away Argentina despite some initial difficulty. After such huge results, one worries that the team could again falter before the World Cup, or even during the tournament. However, this team now has a strong sense of personality. Each player expresses immense pride and strong determination with the green jersey on their back. The tides of change have washed over Irish rugby and all that remains is to keep their focus into next year, but that’s easier said than done. Cameron Hill was the Sports Editor of Trinity News for Michaelmas 2018. He is a Senior Fresh English Literature and French student.